Hi, Scoop here feeding back on all the top stories from our preview performance last night! 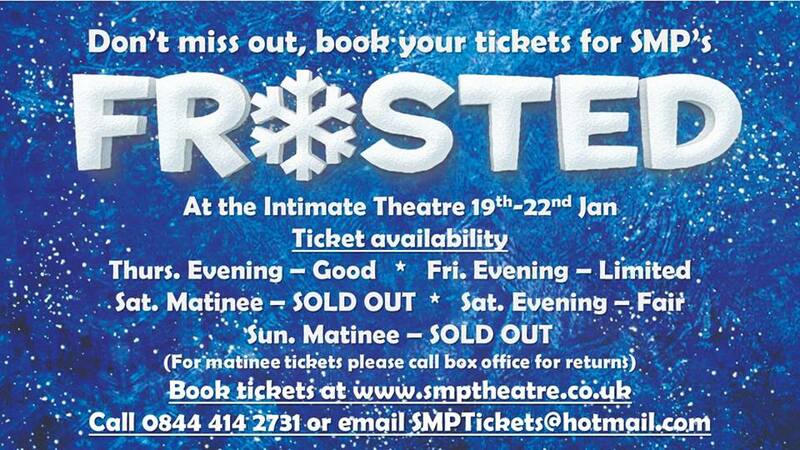 Earlier in the week we received the news that our Saturday and Sunday matinees are sell out shows and that the Friday and Saturday evening performances are following suit. With this information in our minds, we all arrived at the theatre full of excitement, ready to perform to our first audience, the World Premiere of ‘Frosted’ written by Warren McWilliams. Our first performance went down a storm. We received wonderful comments from our audience and it was a magical evening for all. Our actual opening night is tonight and before I disappear back to the world of journalism in Edmontonia, I will leave you with some insider information from ‘Frosted’. Gossip: We have a tip off that Prince Anders is visiting Edmontonia for the coronation of our Queen Ella. I hope that he is as charming as he seems. I will certainly report back on his visit… swoon! Fact: the character Jasper of Joysville is named after the writer Warren McWilliams’ son. Top Tip: Join us for our performance tonight so that you don’t miss out! Failing that book your tickets for Friday or Saturday night before they sell out.